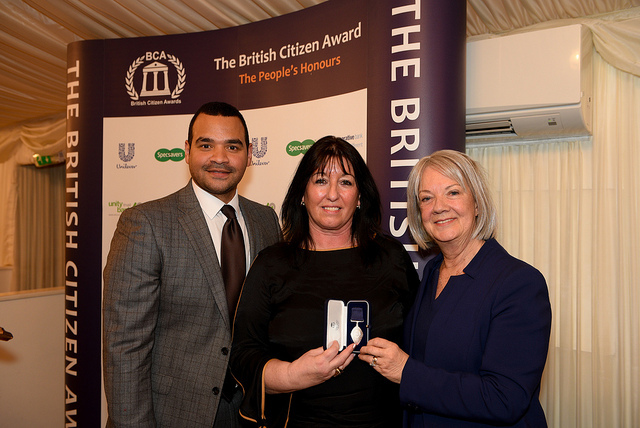 A former social worker who has helped thousands of women in her community has received a British Citizen Award at a prestigious ceremony in London. Linda Kirk, who founded the Just For Women Centre in Stanley attended the service at the Palace of Westminster hosted by Lord Dholakia on Thursday. It is only eight years since the 59-year-old set up her independent, non-profit organisation using craft as a form of therapy for vulnerable women. The idea was to create somewhere they could access free counselling, learn skills, form friendships and re-build their confidence to get back into work. Since then the centre has helped thousands across the region, including many survivors of abuse and woman with mental heal issues. Ms Kirk, joined for her trip to the capital by her co-directors, Lestryne Tweedy and Debbie Rogan. Ms Kirk was welcomed at the Houses of Parliament by Kevan Jones, MP for North Durham, who is a patron of the centre. The success of the project has also been recognised by Stanley Town Council, which last year spent £190,000 on a property the organisation could use for a peppercorn rent. It has now moved from its former home on Front Street, in Stanley, to Thornleyholme Terrace, near the police station. The new building has a tea room and gift shop, with office space and training rooms where women can attend courses and have counselling. Councillor Carl Marshall, who is on Stanley Town Council and Durham County Councillor, said: “The new Just for Women Centre is an excellent facility, and builds on the work done at the previous centre, which has helped countless local families through the most challenging times in their lives. Durham Community Action have recently been supporting Just for Women, proving information and advice on running a cree and signposting them to the Tampon Tax Fund where they were successful in accesing funding.